Description: The majestic Moose wanders near a woodland lake as the morning sun rises in the background. 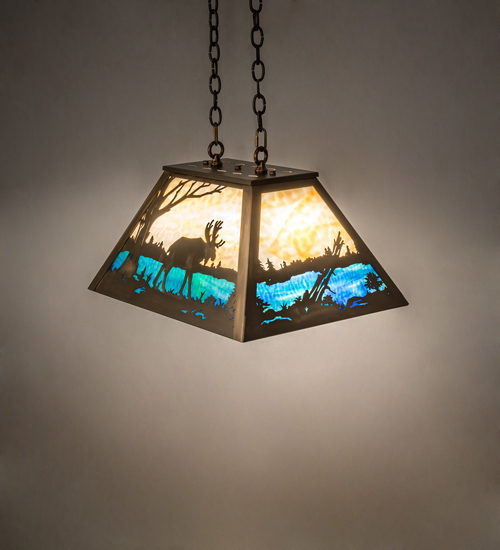 This wildlife inspired pendant provides ambient lighting through a shade featuring a Beige art glass sky above a Blue-Green woodland lake. This pendant features decorative accents and hardware in an Antique Copper finish. The overall height of this pendant ranges from 18.5 to 88 inches as the chain length can be easily adjusted in the field to accommodate your specific lighting application needs. Custom crafted by highly skilled artisans at our 180,000 square foot manufacturing facility at the foothills of the spectacular Adirondack Mountains in Upstate NY. Custom sizes, styles and colors are available. UL and cUL listed for dry and damp locations.